I need you all to come up with jokes and puns for me to use in my CGB Ant Man review! They have to involve shrinkage, small vs. big, uncles and aunts, being a “shrink” (therapist), any ant or aunt puns you can think of. Just keep it clean and clever. Now if you’ll excuse me…(puts on shrinking suit and runs off into the grand horizon). My friends who did participate will be credited in this review using only their initials to protect their privacy. This is my review of Ant Man! “Ant Man? What, was Uncle-Man taken?” says R.L. Alas, it is true; the titular character’s name is Ant Man, a small-scale hero taking on one big challenge. 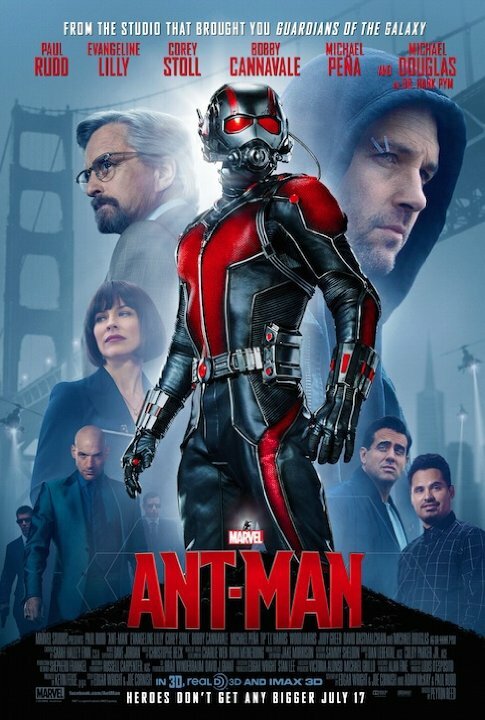 Ant Man is, as said by J.L., “A small idea by Marvel, but made with big plans.” It tells the story of Scott Lang, a savvy thief who just got done serving time in San Quentin for a robbery. He is recruited by tech billionare Hank Pym and his daughter Hope. Hank needs Scott to become the Ant Man and, I quote verbatim, “Break into some houses and steal shiz.” The shiz in question is a shrinkage suit called the Yellow Jacket, which would be used in combat, but if made into copies and given to the masses, could spread chaos in its wake. Scott, Hank and Hope have to steal the suit and destroy it in an orchestrated heist. Witty banter is my favorite style of comedy, and Ant Man doesn’t disappoint. Like Guardians of the Galaxy and the first Avengers movie, the humor in Ant Man is mostly dry, sarcastic banter between the characters. Every joke is timed perfectly and the sarcasm is spot-on without becoming mean-spirited or unpleasant. The movie is very self-aware and focuses on being a fun action comedy rather than going to dark-and-bruiting route. This movie is particularly interested in the relationship between fathers and daughters, and this is displayed in the complex relationship between Hank and Hope Pym. He doesn’t want to lose her, but fails to express this to her. As a result, this makes her feel discounted and ignored by her own father. The death of Mrs. Janice Pym haunts this fractured family. Meanwhile, Scott’s motivations are driven by his love for his daughter Cassie. In fact, interwoven into the film is a great message about rising above your past and being the best version of yourself. Scott is reminded more than once to, “Be the hero Cassie already thinks you are.” This is what pushes him to seek redemption and turn his life around so that he can be the knight in shining armor that his child deserves. I only have two issues: For one, Darren Cross is not a compelling villain. Actor Corel Stoll looks like he’s having the time of his life playing Darren Cross, but the actual character is not that intimidating. He’s your typical evil corporate scumbag who wants to make millions and control the world and blah blah blah. My second issue is that because this movie offers nothing new to the MCU (Marvel Cinematic Universe), it’s fun but forgettable. Granted, mindless action has its place, but it’s kind of sad when a film doesn’t stand out. Overall Ant Man is a small-scale popcorn flick and a welcome addition to the highly-successful Marvel Cinematic Universe.